Africa is the place to go and is a great place of fun for the entire family. 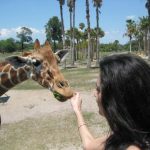 Just over an hour west of Orlando near Florida’s beautiful Gulf Coast, you’ll find yourself on the edge of Africa at Busch Gardens in Tampa Bay. 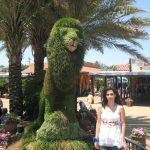 Whether you are a thrill seeker and love the heart pulsating drops of some of the fiercest roller coasters in the world or you have little kids and just want family and kiddie rides, Busch Gardens has it all! 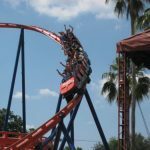 My husband and I had exhausted visiting all the Orlando Parks and we wanted to do something else…we decided to visit Busch Gardens Tampa as we heard about there latest roller coaster ride SheiKra. We could have stayed at one of the recommended hotels near the park, Embassy Suites Busch Gardens or Wingate by Wyndham, but we decided to drive from our Orlando Hotel. We were told by many of our friends if we were looking for thrills to try Busch Garden’s floorless dive coaster, SheiKra: 200 feet up, 90 degrees straight down (leaving one breathless), or to try the mighty Gwazi (another roller coaster) a colossal wooden coaster with a record-breaking six fly-bys and crossing speeds of 100 miles an hour. Or to take a ride on the Kumba, a roaring steel coaster that will also leave us out of breath! Well there was just one problem and I am sure others that are a couple can identify, my husband is a thrill-seeker and I am not! He could not be more excited looking forward to trying out all these roller coasters, and I was pleasantly surprised to see all the activities Busch Garden Tampa had for non-thrill seekers! Okay I might be a little biased but my all time favorite activity and experience at Busch Gardens is feeding the Giraffes (this is an additional fee of approx. $34.00 per person, but is worth every penny) on the Serengeti Safari. My husband and I spent 30 minutes with a group of 12 people in the back of a safari Landrover, open back type vehicle. We put on a lot of sunscreen and wore something cool and sleeveless. I was pleasantly surprised that there were no bugs to deal with as I was prepared to put on insect repellent! We were transported into the heart of the Serengeti and given fresh green Romaine Lettuce to feed the Giraffes. Our tour leader was very amusing and informational; we learnt neat facts about the Giraffes likes and dislikes, mating, birthing, etc. We also found out that Giraffes in the wild live on an average of 20 years, but the Giraffes at Busch Garden in captivity live on average of 30 years. Also one of the original Busch brothers saved Giraffes that were being slaughtered in Africa because they were a menace to crops in Africa. Mr. Busch transported them to the United States of America. We got to meet a 32 year-old survivor Giraffe that was saved by Mr. Busch…She is said to be the oldest Giraffe living in America and she gave birth to around 9 Giraffes…Well it was Mother’s Day Weekend and my heart felt light and my eyes teared up to see and think that not only was Busch Garden integral in saving her life, but we spectators got to reap the benefits of witnessing the legacy of seeing her children that would never have been born if she had been slaughtered back in Africa. live in the greatest country where freedom abounds! The entire participant got to feed up to 3 different Giraffes with lettuce. We also received a photo opportunity one on one to feed the Giraffe incase you did not travel with your own camera! I can’t put into word how wonderful it was to feed these wonderful, gentle, majestic creatures. 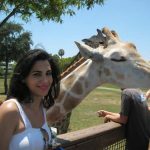 As our tour guide described it,”We are like an ice-cream truck to the Giraffes. They look forward to being fed lettuce because they mostly eat hay and grass. We also learnt about zebras. I never realized these animals were brown and white striped (just think I have been duped by marketing all these years and I would have sworn Zebras are black and white). It was truly great to get up close and personal with some of these exotic species like bongos, elands and ostriches. Although I didn’t get to touch these wonderful creatures I did get really close and got wonderful photos of them. Our guide was truly knowledgeable and personable she helped bring us closer to the wildlife! This is a wonderful experience for children as well! Although we ran out of time and were unable to take the Jungala Tour we spoke with some people who had experienced Jungala and they gave it a thumbs up! We were told that on Jungala you get to meet with the trainers who work with Jungala’s Tigers and Orangutans and these trainers introduce you to the animals they care for daily. Portions of the proceeds from this tour are donated to the SeaWorld & Busch Gardens Conservation Fund, helping to support wildlife and wild places around the world. This tour is approx 30 minutes and cost around $34.00 per person. Well, this will give me a reason to return and to do some tours that we ran out of time to experience! We enjoyed the musical KaTonga at the Moroccan Palace Theater. KaTonga is a 35 minute show with songs and rich infusions of color that takes you on a journey to the heart of Africa in a musical celebration of animal folklore. Storytellers, called Griots recounts African stories that are quite entertaining. The combination of colorful costumes, magical folklore, music, dance provides for a memorable performance. If there is one show that really touched my heart was Critter Castaways performed in the Bird Garden. This show was born as a result of rescuing and shelter animals in need of a home which might otherwise been killed or homeless. The trainers use the same encouraged based training philosophy used throughout the park and created a side show of animals such as dogs and cats, ducks and doves, potbellied pigs and a few surprise animal stars entertain guests with a tribute to the connection found between human and animal. This show is not only a great deal of fun for the entire family it helps funds a home for the care of these castaway animals! This traveling band of instrumentalists with their sparkling red and gold uniforms, this eight-piece marching brass ensemble dazzles children and adults alike with a blend of music, dance and spirited singing. This delightful marching band is known as the Mystic Sheiks of Morocco. My husband and I had the privilege of rubbing shoulders with them as we walked along side of them while they marched playing through the park. Their charm and elegance radiated and entertained all who stopped long enough to pay attention! If you enjoyed the Terminator 3 D film at Universal Studios then you will love Pirates 4-D. Comic genius Leslie Nielsen stars as Captain Lucky, a misfit pirate leading a hapless crew and his loyal first mate, Pierre (played by Eric Idle, author of the show), on a side-splitting adventure. Set in the Timbuktu Theater, this wonderfully funny 4 dimensional movie about Pirates captures the most advanced special effect technology coupled with multi sensory theatrical effects. From being literally splashed with water and puffs of air released in conjunction with scenes in the pirate movie you will have a positively great experience, deep belly laughs for all ages. Being under the A/C helps you cool down as well from the heat of the day! Cothe adrenaline rush supplied by the plummeting drops of the SheiKra. That is all my husband spoke about for the next 2 hours! I am sure the SheiKra is a daredevils dream, however, you couldn’t pay me a million dollars to ride that Roller coaster. However, my husband did talk me into riding the Cheetah Chase– the sweetest, most non-threatening, roller coaster in the park. Only 4 people to a cart and of course Busch Gardens snapped individual/couple photos just as the roller coaster sped and plummeted down the track…. the photos are hilarious to see people turning white (where the blood has totally left their face) or them grimacing as the photo is snapped…the expressions are truly priceless. Take a ride on the Impressive Serengeti Railway. 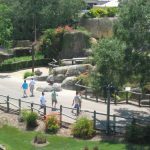 It is my personal opinion when you are looking to cool down or if you are tired of walking, this is one of the best ways to take in the breathtaking beauty and sights of Busch Garden’s Serengeti Plain. The train that we rode on looked like a replica train that they had in Africa back in the 1900’s and brings authenticity to entire experience. The train makes several stops at the Congo, Nairobi and Stanleyville. 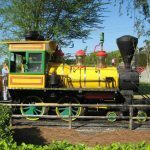 This is a great way to get to the other side of the park if you don’t feel like walking…it is great for parents with small children as they were able to transport their strollers on the train. This relaxing ride gives you a great view of the large free-roaming herds of African animals, including Giraffe, Zebra, Antelope, Ostrich and many more exotic species. Spectators will also gain close-up views of the twisting elements of SheiKra, Kumba and Montu roller coasters at the park. It is a lot of fun to hear all people scream when the SheiKra plummets before your eyes. The Sky ride aerial tram ride is refreshingly different than all other rides offered at Busch Gardens…. you get to take in spectacular views of Busch Garden and its amazing animals from a vantage point high above the crowd! The sky-high trip covers a span from the Crown Colony area all the way to the Congo on the opposite side of the park. If you are apprehensive of heights, this is not the ride for you, but if you don’t mind heights but hate the speed and drops of roller coasters you will enjoy soaring over the Serengeti Plain and on to Stanleyville. Restaurants galore are all over the park. There are opportunities to purchase drinks and refreshments at every turn and corner of the park. Some great eating-places to try are Crown Colony Restaurant, which overlooks the Serengeti Plain but in the comfort of air conditioning, offers a diversified menu (great sandwiches) with wonderful ambiance and dining experience! Try the Zagora Café for healthy wraps if you are conscientious about what you eat. There are a lot of other on the run, grab a bite places, great for getting snacks while on the go. Although I didn’t personally indulge in rides that were geared more for small children. I visited King Tut’s tomb and Land of the Dragons. In King Tut’s tomb, I observed excited child adventurers digging for real buried treasure in a replica of King Tut’s tomb. The sand seemed to be filled with replicas of real treasures found buried in young King Tut’s tomb. It was fun to see children having such fun while learning a little about history! While Land of the Dragons offered an impressive three-story tree house with winding stairways, giant towers, illuminated water geysers and an echo chamber kids love to scream in! There are many children rides, including a dragon carousel and a Ferris wheel. Kids can climb and crawl through a play area, while their parent catch theirs breathes and rested! There were also plenty of dragons, including Dumphrey, a friendly costumed character who could always be seen giving great big hugs to kids. One day doesn’t seem sufficient to experience all this park has to offer. Be prepared to walk a lot, where comfortable shoes and put on a lot of sun screen if you are going to Busch Gardens Tampa in the summer. The waits in lines are no worst than at Disney Parks. You can also purchase a great variety of memorabilia at this park but all the merchandise is like at all parks, very pricey! I plan to go back very soon and bring some friends and family so they can join in the fun and excitement!